Epic Dark Phoenix Poster Rises, New X-Men Trailer Coming Soon? A new poster for Dark Phoenix has surfaced online. This latest entry in the long-running X-Men franchise has been in the works ever since Apocalypse was released in 2016. It's taken some time to actually get it ready for theatrical release but, unless something changes, the movie will finally arrive this summer and the studio is getting ready to show their hand, as this new poster has arrived, with a new trailer also expected to arrive any day now. The poster made its way online, even though it didn't appear to come directly from Fox. In any event, it's out of the bag now and provides us with our first new look at this movie in a handful of months. 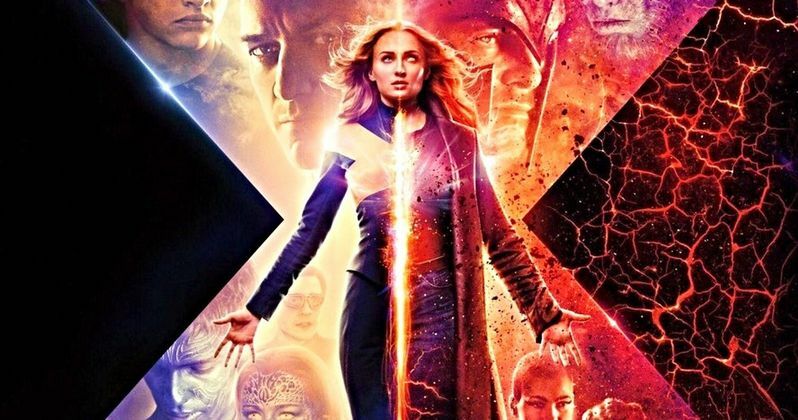 There is a gigantic X covering most of the poster, set against a black background, with Jean Grey (Sophie Turner) at the center, who is literally being torn apart by her two identities. The poster is divided into darkness in light. Magneto on one side, Professor X on the other, as it always has been in this universe, with their allies in tow. As for the new trailer, it's been heavily expected that we would be seeing some new footage sooner rather than later. The first Dark Phoenix trailer was released back in September when the movie was still set to hit theaters on February 14. But Fox bumped that to June 7 right around the release of that first trailer. What we know for sure is that a new trailer has been rated and that director Simon Kinberg recently teased that one is coming "very soon." It's now expected that the new Dark Phoenix trailer will be with us within the week. Simon Kinberg is making his directorial debut with this entry in the X-Men franchise. He's been a long time writer and producer on the series, but Fox decided to hand him the keys to the car on this one. That's proved (and not to put the blame squarely on his shoulders) to be a big ask, as the movie has had to undergo significant reshoots and, given the cast's crazy schedule with other projects, it's been tough to lock everyone down as needed. While rumors have been floating around the movie is a big mess, those are merely rumors. Until this thing screens for critics, there's still hope for this version of the franchise to go out in style. Disney is mere months away from completing its merger with Fox. At that time, Disney, ultimately Marvel Studios, will be in charge of the X-Men and they're going to hit the reset button. That means this will, barring any craziness we can't possibly predict, be the final proper entry in the franchise. The equally troubled New Mutants is also set to arrive later this year, but there are rumors that one could just be dumped to Hulu and more or less written off as a loss. We'll be sure to bring the new Dark Phoenix trailer your way as soon as it arrives. In the meantime, be sure to check out the new poster from 20th Century Fox below.